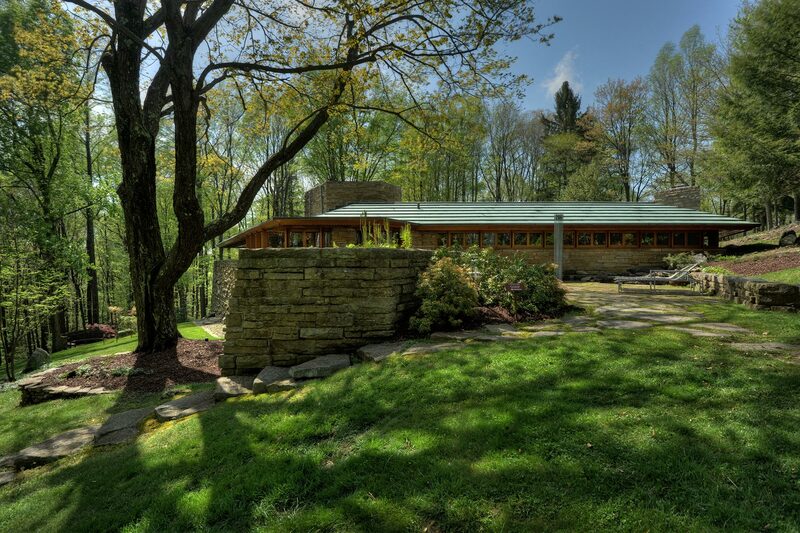 Designed on a hexagonal module, Kentuck Knob is a small, one story Usonian house. 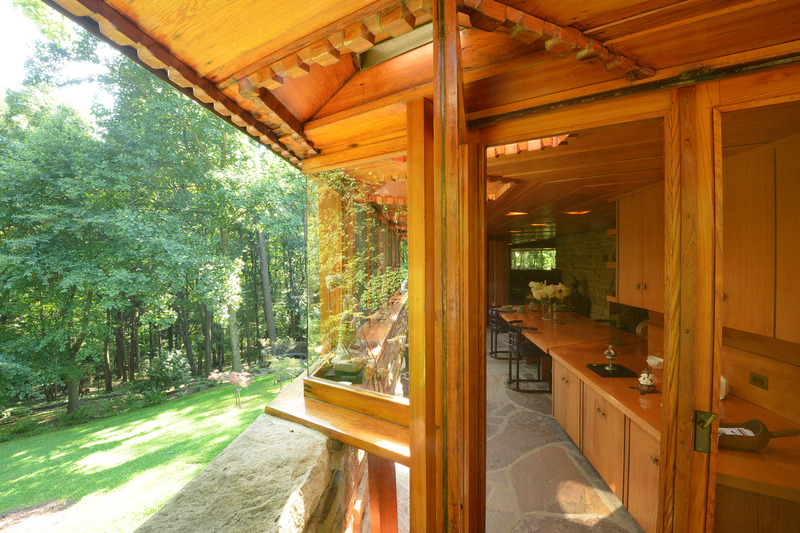 Usonian, meaning affordable for the average American, was a signature design of Frank Lloyd Wright. Both dramatic and serene, the house, situated just below the crest of the hill, appears almost part of the mountain itself and stands 2,050 feet above sea level. As an open floor plan, cantilevered overhangs and great expanses of glass effortlessly integrate the inside with the outside. No house should ever be on a hill or on anything. It should be of the hill. Belonging to it. Hill and house should live together each the happier for the other. Kentuck Knob’s construction materials of native sandstone and tidewater red cypress blend naturally with the surroundings. The fully functional kitchen is the architectural core of the home. Its walls of stone not only anchor the two wings of the house but they also rise to penetrate the horizontal line of the copper roof. An open floor plan, cantilevered overhangs, and great expanses of glass effortlessly integrate the inside with the outside. Stretching to the east, just beyond the back terrace, is a breathtaking panorama of the Youghiogheny River Gorge and the beautiful Laurel Highlands mountains that surround it. Kentuck Knob represents a refinement of the many principles of organic architecture Mr. Wright explored throughout his long career. Today, the interior reflects the taste and personalities of the current owners, Hayat and Peter Palumbo, who are committed to preserve and maintain the house for the enjoyment of all those who, like them, share a deep admiration for Frank Lloyd Wright’s genius. Ready to make your visit?  Purchase your tour tickets today.